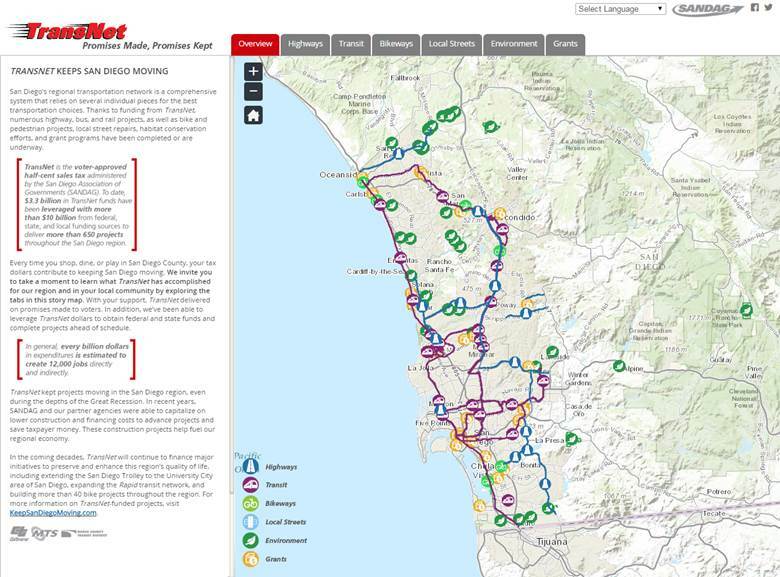 SANDAG leveraged custom GIS and Web programming and ArcGIS Online for Organizations to develop the TransNet Story Map Series. This interactive application highlights the wide range of strategies funded by TransNet and implemented by SANDAG and our regional partners to support the efficient movement of people, goods, and services throughout the San Diego region. View the story map in a new browser window. The San Diego region has changed significantly over the past thirty years. Visualize how growth has changed the urban footprint of San Diego in this aerial imagery animation. View the animation in a media player. These two animations were created using California's Freeway Performance Measurement System (PeMS) data to demonstrate the average weekday traffic flow and speed on the freeway system during the month of October 2006. The graduated circles represent the traffic flow expressed as vehicles per hour passing through a segment of freeway. The color of each circle represents the traffic speed in miles per hour. The animations demonstrate the changes in traffic conditions throughout the day based on five minute intervals. Please note that viewing these files requires users to have or install Windows Media Player. These are large files and some users may experience a delay before the files load and are viewable.